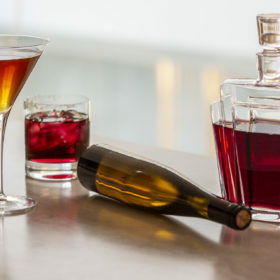 Yes, you can mix your favorite wines into cocktails. From a savory riff on a Dirty Martini that features an Umbrian skin-contact wine to a Whiskey Sour with a float of a robust Sicilian red, here are four cocktails from bartenders around the country that feature Italian wines. Native to Sicily, the Nero d’Avola grape produces wines with a dark, robust character. It’s the right choice for this variation on the New York Sour. A float of the full-bodied red wine adds acidity and a striking ruby hue. In cocktail shaker filled with ice, combine first four ingredients. Shake well, and strain into rocks glass over fresh ice. Gently pour Nero d’Avola over back side of spoon to float atop drink. Garnish with brandied cherry. A complex take on the classic Dirty Martini, the surprise ingredient here is an orange wine from Umbria, a mix of Grechetto, Malvasia, Chardonnay and Sauvignon Blanc. “The wine itself is beautifully aromatic, structured, briny and a bit funky,” says Hedges. It lends depth and aromatics to the finished cocktail. “Picture sitting on the Mediterranean, snacking on sardines and olives and knocking back a few of these as an afternoon retreat,” he says. Combine all ingredients except garnish in mixing glass filled with ice. Stir well, and strain into stemmed cocktail glass. Garnish with pickles and pickled vegetables.